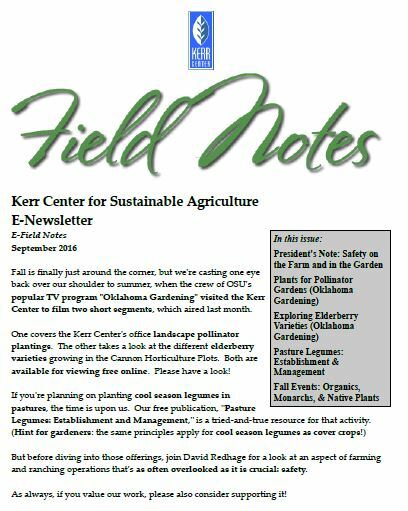 Fall is finally just around the corner, but we’re casting one eye back over our shoulder to summer, when the crew of OSU’s popular TV program “Oklahoma Gardening” visited the Kerr Center to film two short segments, which aired last month. 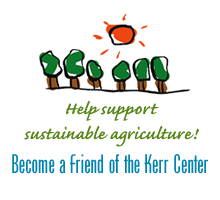 One covers the Kerr Center’s office landscape pollinator plantings. The other takes a look at the different elderberry varieties growing in the Cannon Horticulture Plots. Both are available for viewing free online. Please have a look! But before diving into those offerings, join David Redhage for a look at an aspect of farming and ranching operations that’s as often overlooked as it is crucial: safety. Steam can more effectively combat food pathogens on cantaloupes than traditional removal methods. That’s the finding of an Agricultural Research Service (ARS) scientist in Pennsylvania. Dike Ukuku and his colleagues have demonstrated that a relatively inexpensive steam cleaner (designed to remove wallpaper and clean outdoor grills) can rid cantaloupes of common pathogens more effectively than existing techniques.